Piggyback refers to a strategy of combining a first mortgage with a HELOC to avoid paying PMI on your mortgage. If you have 10% of your home’s purchase price to contribute as a down payment but want to avoid PMI, consider obtaining a first mortgage for 80% of your home purchase and a HELOC for 10% of the purchase price. With this strategy you are essentially financing half of a 20% down payment using a revolving line of credit. Not only do you get the advantage of continuing to build equity as you make your loan payments, but also as you reduce the balance on your HELOC, the credit line becomes available to draw on in case you need cash in the future. 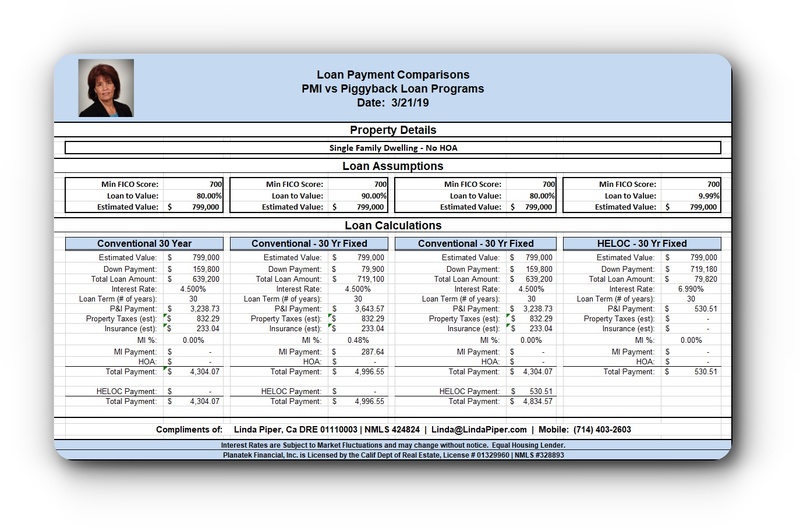 As you can see, the 1st mortgage + HELOC combination offers you a lower combined monthly payment (approximately $162 lower) than the financing option utilizing PMI. Further, more of your monthly payment will apply toward your loan principal helping you to build equity faster than the PMI option. For more details about this program, please give me a call at (800) 680-7875 or send me an email message to Linda@LindaOnLending.com.